There’s nothing worse than having a stain on the carpet. Whether it is caused by a customer tracking something in on his boots, an employee accidentally dumping her lunch on the ground or coffee spilled on the floor, a dirty carpet looks unprofessional and gives the customer an unfair impression that the business is dirty and unkempt. Even if the stain isn’t in a high traffic customer area, a small stain can bring down employee morale and serve as reminder that the company they work for just simply doesn’t care about the quality of their facility. Carpets play an important role in creating a healthy indoor environment so keeping it clean will extend its life and keep its appearance longer. Some stains can be easily taken care of if they are treated promptly. Unfortunately, in a business situation that isn’t always practical as employees can be pulled away by meetings, phone calls and other distractions. Sometimes people don’t even realize they’ve made a mess at all. In other situations, employees don’t have the access to the proper cleaning tools to get the job done quickly and properly. Hiring a carpet cleaning service is another solution, but that can be expensive and impractical on busy days. That’s why it’s always helpful to have a few simple products on hand to help with carpet stains. Stock a supply closet with basic materials such as white paper towels, club soda and for tougher stains that just can’t be left to chance, a high quality, professional carpet cleaner. * Always test the cleaning agent of your choice on the carpet in an inconspicuous place first. 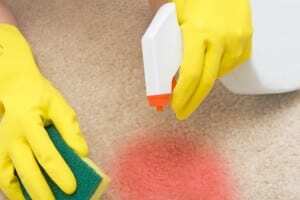 Even if you’re using a natural remedy instead of a powerful commercial cleaner, you need to be absolutely sure the cleaning solution won’t discolor the carpet or worse, leave a more permanent stain behind. * Make sure not to scrub or brush stains because it can end up causing the stain to go deeper into the carpet fiber. Instead, blotting with a plain white paper towel is often the best solution. * Don’t over wet the carpet. When cleaning, one of first instincts is to wet the area, but in most cases a quick dampening, if necessary, is all the area needs. Over wetting can create a whole new set of headaches. * Vacuum frequently. This simple action can lift up dirt that over time can turn into a stain. * Do not overuse any type of cleaner. This could leave behind a residual residue that will be very difficult – if not impossible – to remove later. If there is dish detergent at the lunchroom sink, try mixing a small portion with water and blotting the stain (remember to always test another small area first). A combination of laundry detergent and water may also work if you have it on hand. Club soda can also be a good solution. Dab with a touch of club soda then allow the area to dry. Sometimes a stain requires a tougher approach. Worldwidejanitor.com carries a complete line of effective carpet cleaning products from some of the best manufacturers in the industry like Snee Chemical Company and Champion that leave no odor behind or heavy residue. They are perfect for a quick cleanup. Most penetrate deep into the carpet fibers to lift up light as well as heavy-duty stains like oil, blood, gum and enamel spray paint. Some of the cleaners actually do double duty as they can be sprayed on high-traffic areas to maintain a quality appearance. They clean and take away odors – a trait that customers and employees alike will appreciate. This entry was posted in Floor Care and tagged bonnet care, carpet, carpet detergent, carpet mousse, carpet spotter, defoamer, low foam, nutri, rug shampoo. Bookmark the permalink.